When we get close to the end of the year, there are three different things I think about personally: Thanksgiving (my favorite holiday), my upcoming birthday (December 1, in case you are wondering) and the Christmas season. These three things bring together some of my other favorite things, like my family, Christmas lights and delicious food. To me, there is nothing better than sitting in front of the parents’ cabin in the woods (they really do live in a cabin in the woods) with family and a glass of wine. I have a lot to be thankful for. As a fundraiser, however, my mind goes in a completely different direction. I frantically think about end of year appeals, Giving Tuesday, goals and planning for 2019. The months of November and December can drive a fundraising professional crazy. After all, nearly one third of giving occurs in December! That is more than 30 percent of your fundraising goal in one month! This makes the rest of the year seem obsolete – but it isn’t. (And you can read this post about why I think it’s important to start your annual fund in January.) 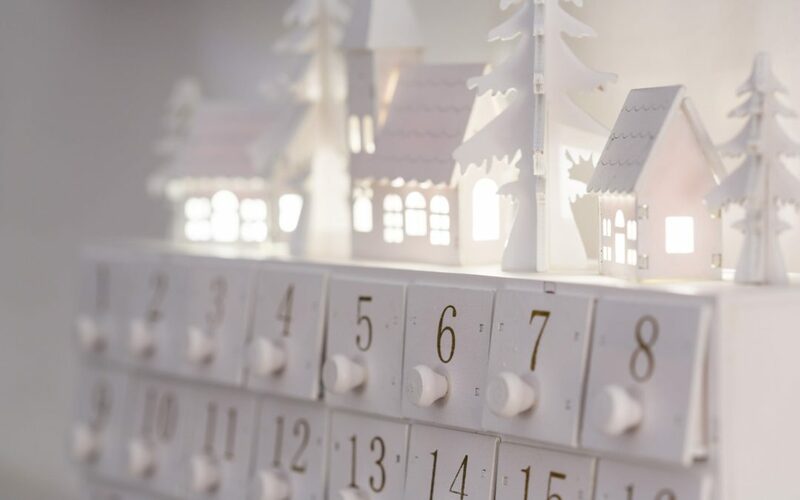 Still, with November and December being so busy, it is important to keep track of everything happening – and what better way to get organized than with a calendar? Since the Aldi wine and cheese Advent calendars sold so well, I thought I’d come up with my own. This one starts on Giving Tuesday and goes through the end of the year. I realize that isn’t how Advent works, but go with it. 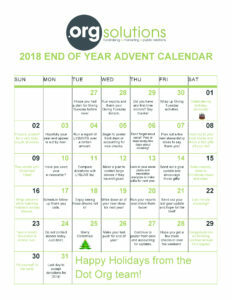 I hope this calendar helps fellow fundraisers handle the craziness of these last months of the year, reminds them of important dates and gives them some peace of mind (trust me – you are doing fine!). Are you in need of fundraising and on-site consulting? Contact us at [email protected] for more information.